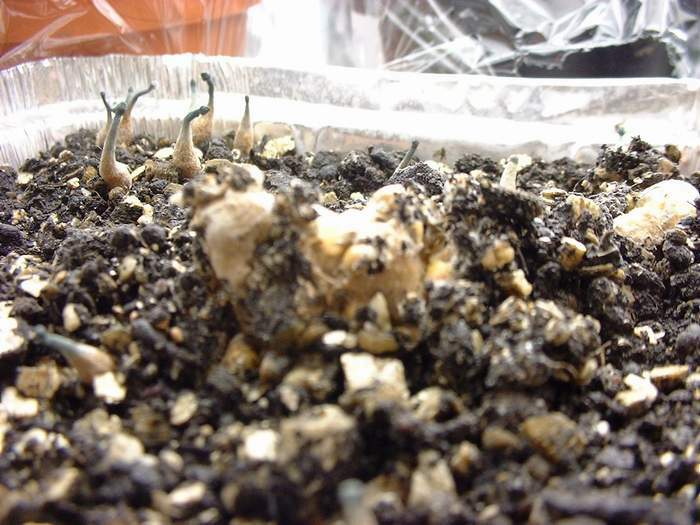 The sclerotoia grew from a 1/2 pint jar of birdseed and weigh 26 gram. The biggest weighs 6.5 gram. They taste like walnuts. Edited by Anno on 05/14/01 07:47 PM. What should I do with them, can they be stored in the fridge(fresh) or should I dry them? Edited by Anno on 05/14/01 07:49 PM. Are you 100% sure that the culture you used was Pan. cyanescens? Edited by Una on 05/14/01 07:56 PM. I isolated the culture from a sporeprint which I recieved and was supposed to be Pan. cyanescens. Where did you get that print from? Frankly, I don?t know. I have got quite a lot of them and at the begining of my growing endeavours I haven?t had each and every print properly archived so I don?t realy know who and when sent it to me. Did you order any mexicana, or tampanensis, or semi's. What did the mycelium look like on agar, color, texture? Yes, I have also tampanensis mycelium, but unlike it the Pan.cyanescens mycelum was whispy and bright white. Hmmm, yeah thats screwy. Pans fruit quickly if they are going to fruit at all and are not that resistant to contamination. If you have a scope you can look at the spores. Pan spores are distinctly lemon shaped. If you want to confirm the identity, I can check out a sample of the spores. I suspect they are one of the known sclerotia formers. I would be very very suprised if that is pan cyan sclerotia. It looks identical to mexicana and tampanensis sclerotia to me. - Mexicana deffinitely falls out because I (unfortuantely) never ever came near a mexicana culture or a print yet. - I?ve got a culture of tampanensis that I innoculated a few rye grass jars with back in january that are still resting on a shelf and slowly producing sclerotia. - or it was really Pan.cyanescens that produces sclerotia. One more thing: the mycelium between the birdseed when I broke it appart to collect sclerotia was still very light and thin, like from Pan cyanescens or tropicalis, nothing like it looks in the tampanensis jars. I?ll clone a sclerotium and pass a few cultures to a few colleagues then we?ll perhaps find out what it was. can they be stored in the fridge(fresh) and how long or should I dry them? Edited by Anno on 05/15/01 02:11 AM. Think that drying will give you longer storage possibilities! Because it is a source of nutrition (for bacteria etc) and it contains water it's perishable. Dry it, and it's storable! If you can spare a small sample of the spores as well as a culture I could make a better assessment. A small fraction of a print (or scraping into a plastic baggie if on glass) would be plenty. I can provide a mexicana print for your trouble if you are interested. The problem is I don?t realy know from which sporeprint I made this jar. All I know is that the sporeprint was labeled Pan. cyanescens. I cloned a sclerotium and will send you a culture if all goes allright. Edited by Anno on 05/15/01 02:20 PM. Today I found some pictures I forgot about. They show the casing that produced the above sclerotia. You can see some aborts behind a sclerotium. The casing didn?t bring up any fullgrown mushrooms. Edited by Anno on 05/18/01 01:43 AM. Edited by Anno on 05/18/01 01:46 AM. I would have to agree with Una. I suggest going through your pan prints again and see if you can figure out which spores did this. Do you even have some tamp spores around, and if so what is the source? Also, there is no need to make a clone of a sclerotia. 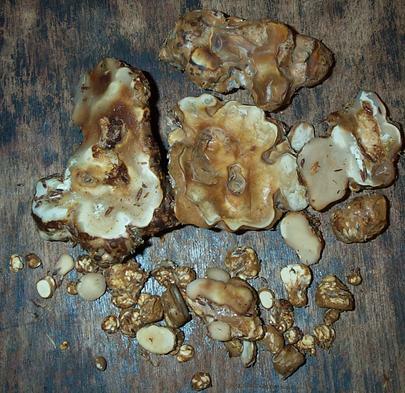 Dried sclerotia is viable and ships easily. so I could reaktivate a dried sceletoria I buy in a smart shop? just wah with h2o2 and place on agar? Yes, you could. It has been done several times in the past by others. 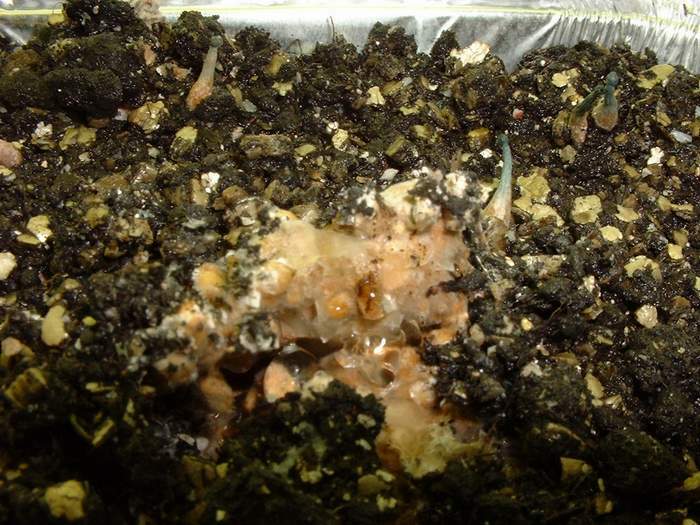 You can even just plant the sclerotia in a casing mix and harvest the fruits for cloning or prints. You will find dry sclerotia hard to cut, so wash in H2O2 and rehydrate in sterile water and allow to fuzz up a bit. Then clone a bit of internal tissue. wild P. mexicana - strange growth on agar? 6,591 topic views. 3 members, 4 guests and 1 web crawlers are browsing this forum.